Heat oven to 350°F. Cut shrimp along outside curve almost to other side; spread open. Remove any visible vein. Place cut side down on ungreased cookie sheet so that tails stand up and curve over shrimp. In small bowl, combine all remaining shrimp ingredients; mix well. Brush mixture over shrimp. Bake 5 to 7 minutes or until shrimp turn pink. Meanwhile, in blender container, combine all chile aïoli ingredients except cilantro; blend until smooth. To serve, drizzle small amount of aïoli onto serving platter. Sprinkle with 2 teaspoons chopped cilantro. Place cooked shrimp over aïoli. Serve with remaining aïoli. This delicious dish can be made up to four hours ahead of time. Prepare the shrimp, lime juice mixture and chile aïoli ahead. Cover and refrigerate. 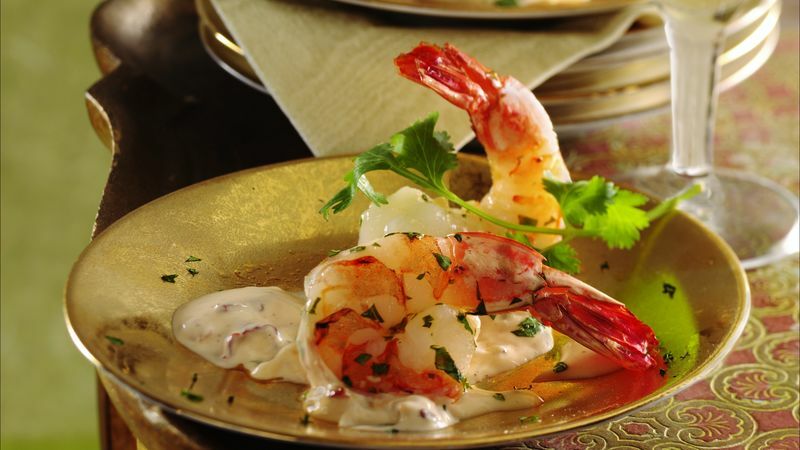 Just before serving, brush the lime juice mixture on the shrimp, then broil. Serve the shrimp with the chile aïoli as directed.